Follow the news of COP24 throughout the two weeks of negotiations on our live page. COP24 : WHAT’S AT STAKE? The COP24 at Katowice promises to be a major summit since COP21, as one of its objectives will be to adopt decisions guaranteeing the full implementation of the Paris Climate Agreement, which will enter into force in 2020. All decisions relating to the climate efforts of the international community (transparency, accountability, etc.) as well as the assessment and revision of national commitments (monitoring, reporting, etc.) will be compiled in a “RULEBOOK” or “KATOWICE RULES“. The most difficult points of negotiation promise to be those relating to DIFFERENTIATION (whereby each country is required to make efforts depending on its economic capacities and its responsibilities), to ADAPTATION and to FUNDING. At the COP21, the countries had committed to publish a new version of their NATIONALLY DETERMINED CONTRIBUTIONS (NDCs) every 5 years from 2020 onwards. From 2023, to facilitate this revision, a global assessment of NDCs will be conducted every 5 years to assess whether the collective effort made is in line with the temperature goals of the Paris Agreement. A first prefiguration of this NDC review was launched in 2018 as part of the facilitative dialogue. As part of this dialogue, throughout 2018 all state and non-state actors were invited to answer 3 questions: « where are we? Where do we want to go? And how to we get there?”. The answers provided should make it possible to agree at COP24 on first tangible steps to take stock of the progress made. Imagining a +4°C world, what about water? 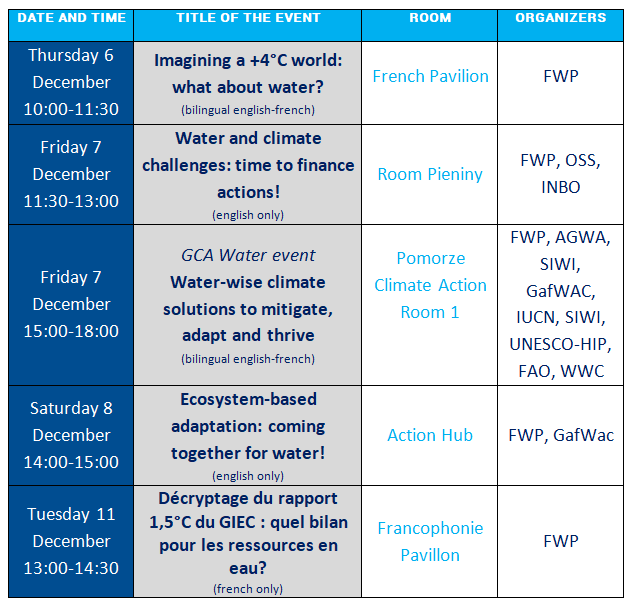 Water and climate challenges: time to finance actions! Ecosystem-based adaptation: coming together for water! 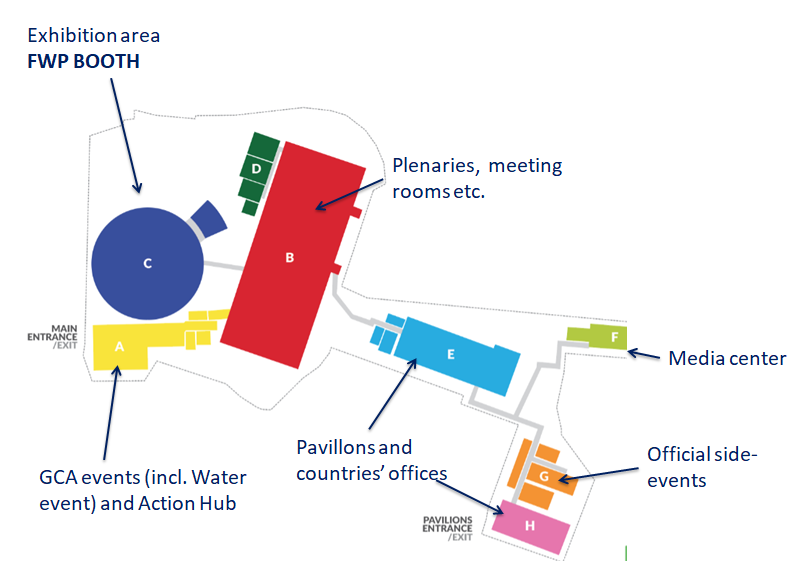 We also invite you to discover the events of interest at the COP24 identified by the FWP here. The FWP will be present in the exhibition area (booth n°99) from Tuesday 4 December to Friday 14 December. During the whole COP, the FWP will be active online everyday on twitter. Regular progress reviews of the negotiations and short videos will be presented on the “live” page of the FWP during the 2 weeks. To find photos of the COP, we invite you to visit our Flickr account. The video Imagining a +4°C world : what about water?